The ability to block people from calling or messaging an iPhone or iPad is an undoubtedly useful feature, but there may come a time where you wish to undo that block. Fortunately, unblocking a contact from iOS is straight forward and easy, so whether you have changed your mind, accidentally blocked someone, or have just decided you want to hear from whoever you blocked again, we’ll show you how to quickly unblock someone. By unblocking a contact or phone number from reaching your iPhone, iPad, or iPod touch, their attempts to contact you through phone calls, FaceTime, and messages will be resume again as normal. We’re going to focus on the iPhone here since most users who are blocking numbers and people are likely doing so from an iPhone, though if you happen to be blocking from another iOS device you’ll find the process is the same. 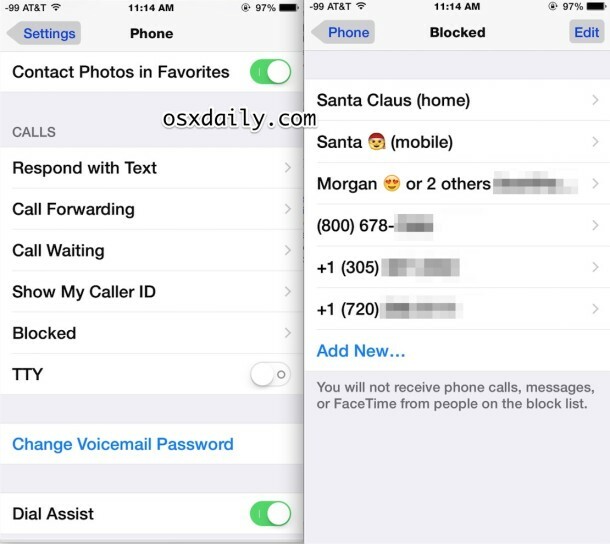 In the example screen shots, you’ll see ‘Santa mobile’ being unblocked (who really wants to block Santa anyway? It’s Santa, come on! ), which would allow The Claus to be able to reach you again. You can also just temporarily unblock a number or contact using this trick if you need to communicate with that person or thing, and then immediately block the number again if you want your peace and quiet returned. That’s a particularly helpful strategy for handling nuisance solicitations and sales calls, or if you’re trying to ask to be removed from a call list. You can also unblock a person by selecting their contact information in the phone app list, and then choosing the “Unblock” option that way, though that’s really only useful for recently blocked people since if they have been blocked for a long time the calls will not show in the iPhone call list. If you have any other tips or tricks about unblocking phone numbers, contacts, and callers on the iPhone or iOS, share with us in the comments below! My block list is quite large on iPhone because I block every solicitation and robocall that I get, which is really quite a lot these days. I don’t think I have ever wanted to unblock any caller, but I would unblock Santa Claus. I guess Morgan stays blocked though, poor Morgan. I have had to block hundreds of women from calling me. I change my number and somehow they still manage to get it. ProTip: DO NOT become a rich and famous Hollywood movie star. John, I can totally relate. My iPhone never stops buzzing, constantly full of women I have to block. I got married to a babe, and it still didn’t stop, they just keep calling. I finally had to hire an assistant whose exclusive job is to block calls for me on the iPhone. Sigh. You said you deleted his contact number. That’s why you can’t find it. If you delete something, it is no longer there. You need to add the contact again if you want to have the contact again. That’s how this works. Impulsive decisions are often later regretted. I blocked my kids automated calls from his school a few weeks ago and realized that it was a number that I sometimes need so I unblocked it but the voicemails are still going to the blocked voicemails section. Seems like a bug I guess. Can’t figure out how to unblock them. I’ve verified that the phone number is the same as the one I unblocked etc. You’re very welcome Rob, glad this tricked help you out! Fortunately once you learn how you find it’s pretty easy to both block and unblock a caller on the iPhone, I one time accidentally blocked a dentist office and had to unblock them – oops!